Here I thought I had renewed energy, but instead was thrown back on the couch for more sleeping and dozing off and conserving energy for the little one growing slowly. And growing it is. 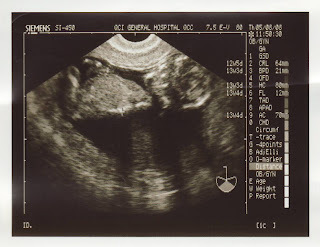 Last week we had an early ultrasound where we got a very clear peak of this 6cm long baby. It's amazing that everything seems quite proportionally developed at such an early stage. This picture may be hard to read, but if you look closely you can decipher in the upper part of the photo the baby lying on it's back, horizontally, with a leg and knee sticking up on the left, it's head is on the right. The wonders of technology. All of a sudden there's a real baby in the small belly bump that's slowly starting show. I'll be off line for a bit (again) as tomorrow Lief and I are taking off for a trip to Vancouver, visiting family and friends. On Saturday my Mom will join us on a trip to Coupeville WA, where a friend and I will take a workshop jewellery feltmaking with Lisa Klakulak! I hope my energy will be sufficient to enjoy and learn lot's! Will try and document as much as I can and post a few pics when I return.